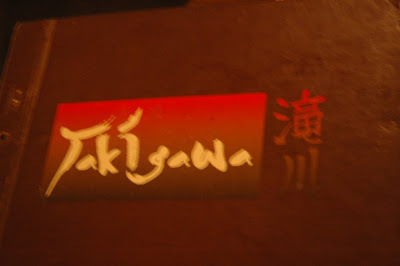 One of the surprise finding of my trip to Indonesia, Takigawa restaurant captured my attention with their nice display of the food, great taste, and nice ambience (they have free Wi-Fi connection too! ).We typically oversaw this restaurant because of the bigger-name chain restaurants available at the mall. 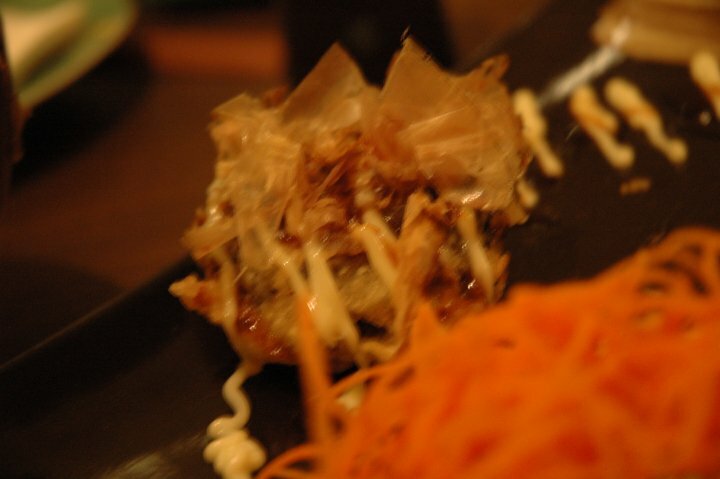 On with the starters for the day… Shiitake Ball and Kawa Salad. An early surprise for me, this deep-fried shiitake mushrooms were filled with minced beef, then garnished with Katsuobushi, Japanese mayonnaise and sauce; An excellent combination of savoury starter. Kawa, deep-fried skin, salad added a nice addition of freshness to the starter. 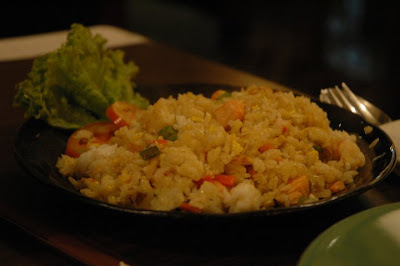 We started the main course with a nice plate of Chahan, Seafood Fried Rice. 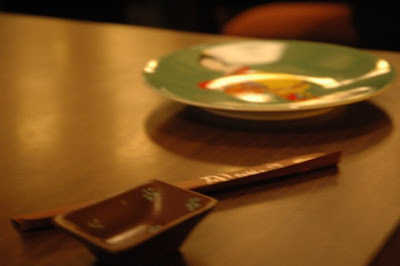 A generous serving of seafood for its price, Chahan acted as the tummy-filling main course. My all-time favourite dish came next: Syake kabutoyaki, a.k.a. 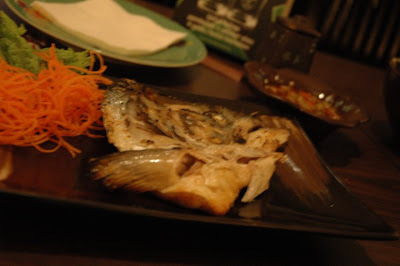 Salmon Head Teriyaki. Yes, you read it correctly… the best piece of salmon (yet, the cheapest!) grilled and salted to perfection with teriyaki glazing. Granted that this part of salmon took a bit of effort, but it’s only 1/5th of the price of Salmon Belly and you got twice as much meat. Our last main course of the day was Cheezy Seafood Pan. 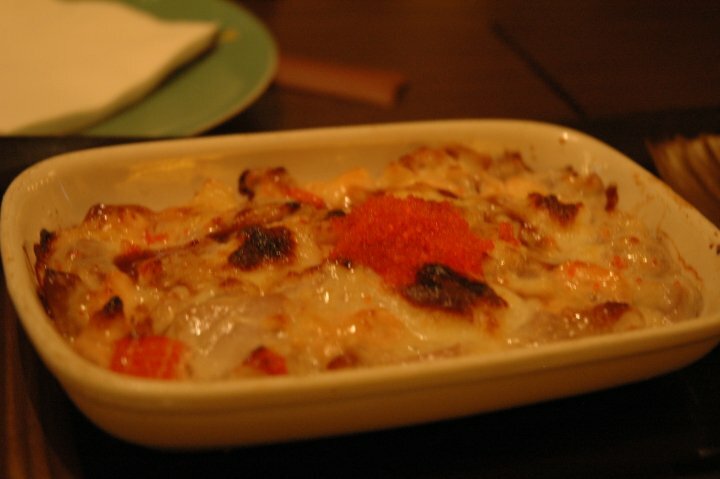 Bear a striking resemblance to Sushi Tengoku’s baked scallop, this dish was an absolute killer. 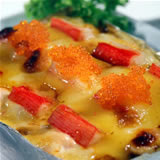 Layers of grilled scallop, salmon, tuna and crab stick baked in a melted cheese and mayonnaise with tobiko. 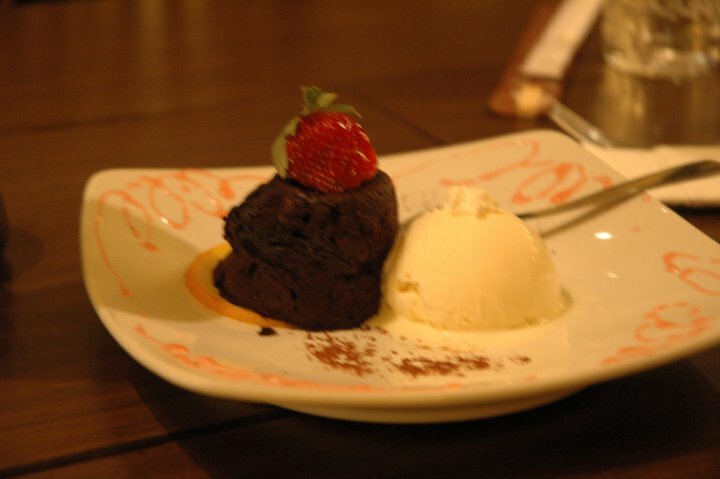 It’s just wonderful to taste, but unfortunately the portion is quite small (you might need to order two plates). For refreshment we chose the all-too-standard Hot Ocha (Japanese Green Tea), but it was a free flow! So, you can have the tasty Green Tea as much as you like. 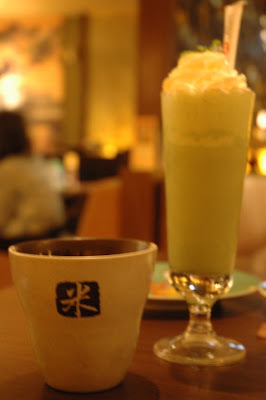 We also ordered Green Tea Smoothies. Again, the taste of it was as expected of any other Japanese Green Tea. Chocolate Melt seemed to be the big kick to end the night, however the Chocolate Souffle was sort of a letdown in what could have been a perfect dinner experience. Overall, it’s still a worthwhile visit to the restaurant and we’re still eyeing for the Green Tea Creme Bruleé, they were sold out when we were there. Additionally, there are like 100+ choices that you might want to explore in this restaurant. As mentioned on my other review, Surabaya Town Square (Sutos) is the newest shopping mall in Surabaya. If you want to go there, don’t go on weekends since there will be crazy amount of people trying to get into the mall. Traffic management has become the main cause of chaos surrounding the venue. Lack of parking space and poor parking space design has led to congestion in every entrance and exit of the mall.